Budapest has many municipal parks and most have playgrounds for children and seasonal activities like skating in the winter and boating in the summer. Access from the city center is quick and easy with the Millennium Underground. Budapest has a complex park system, with various lands operated by the Budapest City Gardening Ltd. The wealth of greenspace afforded by Budapest's parks is further augmented, a network of open spaces containing forest, streams, and lakes that are set aside as natural areas which lie along not for from inner city, among others the Budapest Zoo and Botanical Garden (established in 1866) in the City Park. 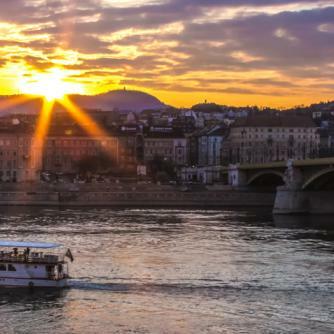 [ The most notably and popular parks in Budapest are the City Park which were established in 1751 (302 acres) along with Andrássy Avenue, the Margaret Island in the Danube (238 acres or 96 hectares), the People's Park and the Kopaszi Dam. Park on Margaret Island, Aerial panorama with the Margaret Island: Seven islands can be found on the Danube: Shipyard Island, Margaret Island, Csepel Island, Palotai-sziget (now a peninsula), Népsziget, Háros-sziget, and Molnár-sziget. Notable islands include: Margaret Island is a 2.5 km (1.6 mi) long island and 0.965 square kilometres (238 acres) in area. The island mostly consists of a park and is a popular recreational area for tourists and locals alike. The island lies between bridges Margaret Bridge (south) and Árpád Bridge (north). Dance clubs, swimming pools, an aqua park, athletic and fitness centres, bicycle and running tracks can be found around the Island. During the day the island is occupied by people doing sports, or just resting. In the summer (generally on the weekends) mostly young people go to the island at night to party on its terraces, or to recreate with a bottle of alcohol on a bench or on the grass (this form of entertainment is sometimes referred to as bench-partying). Csepel Island (Csepel-sziget, Hungarian pronunciation: is the largest island of the River Danube in Hungary. It is 48 km (30 mi) long; its width is 6 to 8 km (4 to 5 mi) and its area comprises 257 km2 (99 sq mi), whereas only the northern tip is inside the city limits. Hajógyári-sziget, or Óbudai-sziget) is a man-made island located in the third district. This island hosts many activities such as: wake-boarding, jet-skiing during the day, and dance clubs during the night. This is the island where the famous Sziget Festival takes place, hosting hundreds of performances per year and now around 400,000 visitors in its last edition. Many building projects are taking place to make this island into one of the biggest entertainment centres of Europe. The plan is to build apartment buildings, hotels, casinos and a marina. Luppa-sziget is the smallest island of Budapest and is located in the northern region of the city. Rock of Ínség can be found in the river Danube under the Gellért mountain. It can be seen only during a drought period when the river level is very low. Széchenyi Thermal Bath in City Park: One of the reasons the Romans first colonised the area immediately to the west of the River Danube and established their regional capital at Aquincum (now part of Óbuda, in northern Budapest) is so that they could utilise and enjoy the thermal springs. There are still ruins visible today of the enormous baths that were built during that period. The new baths that were constructed during the Turkish period (1541–1686) served both bathing and medicinal purposes, and some of these are still in use to this day. Budapest gained its reputation as a city of spas in the 1920s, following the first realisation of the economic potential of the thermal waters in drawing in visitors. 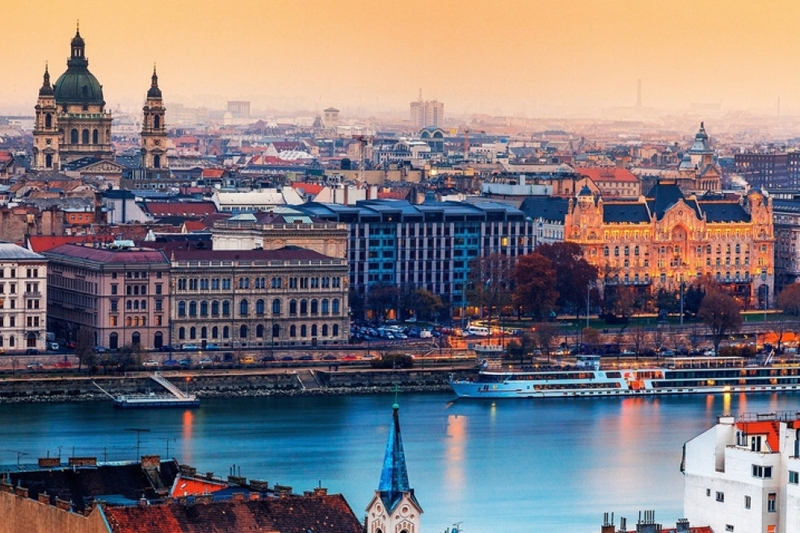 Indeed, in 1934 Budapest was officially ranked as a "City of Spas". Today, the baths are mostly frequented by the older generation, as, with the exception of the "Magic Bath" and "Cinetrip" water discos, young people tend to prefer the lidos which are open in the summer. Construction of the Király Baths started in 1565, and most of the present-day building dates from the Turkish period, including most notably the fine cupola-topped pool. The Rudas Baths are centrally placed – in the narrow strip of land between Gellért Hill and the River Danube – and also an outstanding example of architecture dating from the Turkish period. The central feature is an octagonal pool over which light shines from a 10 metres (33 ft) diameter cupola, supported by eight pillars. The Gellért Baths and Hotel were built in 1918, although there had once been Turkish baths on the site, and in the Middle Ages a hospital. In 1927, the Baths were extended to include the wave pool, and the effervescent bath was added in 1934. The well-preserved Art Nouveau interior includes colourful mosaics, marble columns, stained glass windows and statues. The Lukács Baths are also in Buda and are also Turkish in origin, although they were only revived at the end of the 19th century. This was also when the spa and treatment centre were founded. There is still something of an atmosphere of fin-de-siècle about the place, and all around the inner courtyard there are marble tablets recalling the thanks of patrons who were cured there. Since the 1950s it has been regarded as a centre for intellectuals and artists.